This radio screams Art Deco! Gorgeous design work. Wow! Some collectors say this was Wilcox Gay's take on the "Mae West" radio, which was made famous by Emerson and it's very easy to see why. 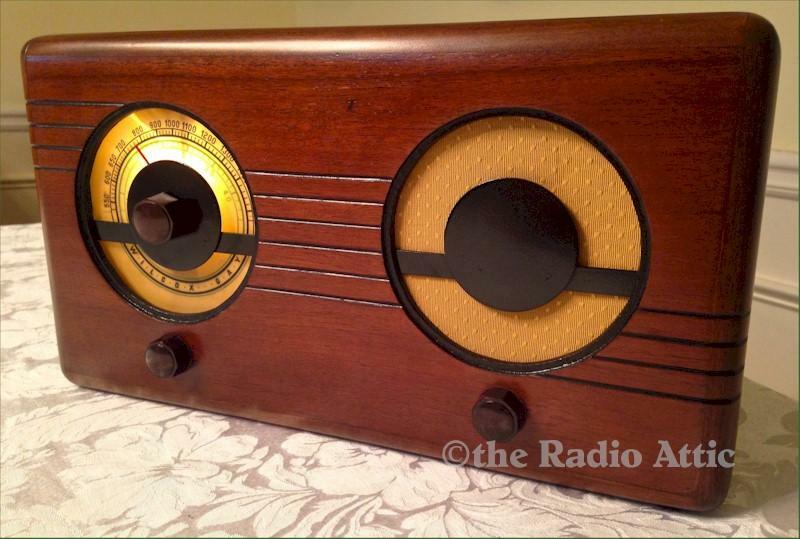 This Art Deco beauty features a gorgeous solid walnut cabinet, black accent stripes, bright colorful backlit round dial coupled with a round grille, elegant gloss black trim along with very nice performance on both the AM broadcast and shortwave bands. Both the cabinet and electronics have been restored and she's ready to be enjoyed by you! 14-1/4"W x 7-3/4"H x 6-1/2"D.